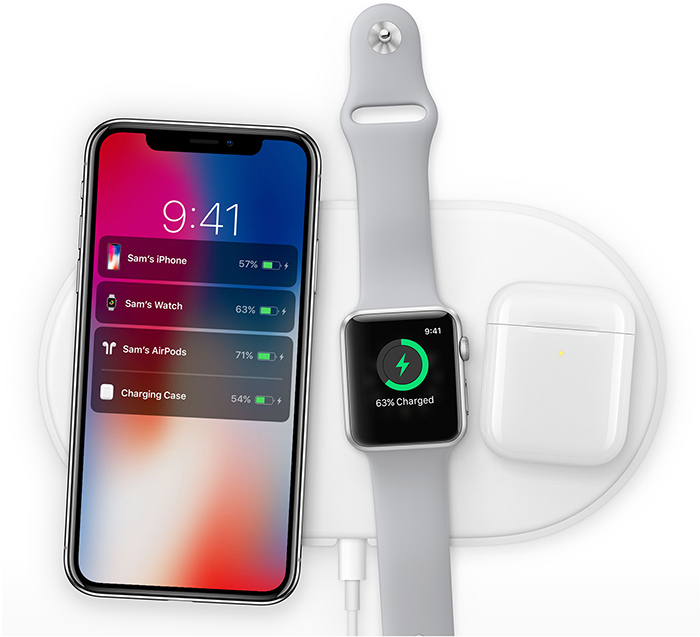 Apple's long-awaited wireless charging mat AirPower might finally be on the horizon if the latest rumor is to be believed. Hong Kong website ChargerLAB cites a "credible source" within Apple's supply chain who claims Chinese manufacturer Luxshare Precision has started production of the AirPower. In a conversation on Chinese messaging app WeChat, the source adds he has heard the AirPower will be released soon. A few weeks ago, developer Steve Troughton-Smith said he's heard Apple may have overcome technical challenges with the AirPower and could move forward with a release. Those technical challenges included overheating and interference issues, according to Sonny Dickson, an occasional source of Apple leaks. The delayed release of the AirPower is likely why Apple has yet to release its optional wireless charging case for AirPods, which remains listed as "currently unavailable" on Apple's website. Like the AirPower, Kuo said the wireless case may be released in early 2019 ahead of an entirely new pair in 2020. Apple's silence regarding AirPower has led some to believe the product has been canceled, but today's report offers renewed hope. ChargerLAB did, however, inaccurately report that the iPhone XS, iPhone XS Max, and iPhone XR would be bundled with a faster 18W USB-C power adapter from Apple. The website did show an accurate render of the charger, but it ended up being for the 2018 iPad Pro, so the rumor wasn't entirely off base. I would be interested as long as it's not over $100. But we all know this thing will be priced well above that. Too late, moved on. Decided I was done with flat charging mats and wanted a proper stand for my phone anyway. Let the snarky comments begin, just like original AirPods. It will likely be a popular product if it works as designed. 29W charger required, sold separately. This really isn’t targeted at someone who only has a phone. It’s best used by someone who uses a range of Apple products which charge wirelessly. I can easily see coming home, laying my phone on the mat, taking off my watch, and pulling my AirPods case out of my pocket, and laying them all on the mat, then heading for the shower. They may get moved around during the night, but by then they may all be fully charged. I can see having one at work and home. Maybe even having one in the car. In addition, I’d have a stand for the phone where I needed that, a stand on my night table for the watch. AirPods don’t need anything. Future applications might include the Apple remote, Mouse, trackpad, and any other devices that currently charge by Lightning. Something like this is never too late to market. Never mind that most of the public doesn’t even know about this product, or that Apple missed its shipping window. And a large number of Apple customers are still using phones that do not have wireless charging. What’s all this fuss about a wireless charger? AirPods were released only three months after they were announced, and were priced competitively. AirPower was announced with a TON of hype almost 18 months ago. Based on Apple's pricing of their own USB-C chargers, this thing will be expensive as hell. All the while, everyone who purchased an iPhone 8, 8+, X, Xr, Xs, and Xs Max have been buying up $15 Qi chargers on Amazon this entire time. AirPower will never be in the same league as AirPods. My opinion is not snarky; it's a harsh lesson for Apple. This ship sailed away long ago and Apple missed the boat.